To mark Holocaust Remembrance Day on January 27, every year, the Dante Alighieri Society of Michigan organizes activities commemorating those Italians who suffered persecution under the Nazi occupation during World War II and as a result of the Racial Laws imposed by the Fascist government. Seven hundred and seventy six Italian children under the age of 14 were deported to Auschwitz. Only 25 survived the gas chambers. Luigi Ferri was one of them. As the child of mixed marriage he could have avoided deportation, but he refused to abandon his beloved Jewish grandmother when she was arrested in June 1944 in Trieste. At Auschwitz they were sent to the gas chambers, but Luigi was spared at the last moment, only because a Jewish inmate who was working as a doctor at the hospital of the camp, Dr. Otto Wolken, took him under his protection. Luigino remained hidden for weeks in a barrack and was then registered (tattooed) and “employed” as an errand boy. He and his protector miraculously survived the liquidation of the camp. 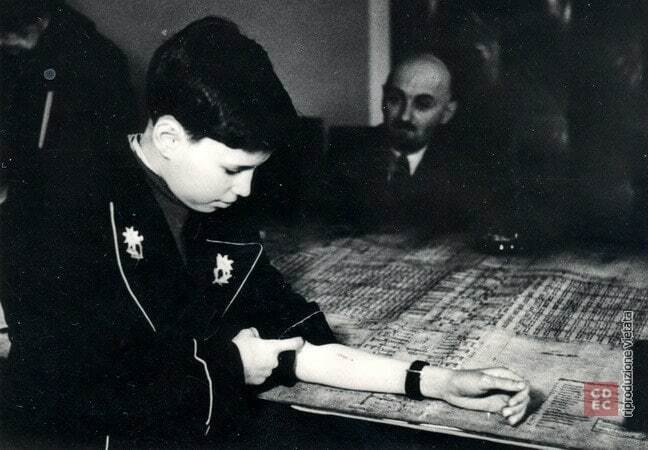 In April 1945, Luigi was one of the first witnesses of the atrocities of the camp to appear before a Polish tribunal. Afterwards, he mysteriously vanished for the rest of his life, the only Italian Auschwitz survivor of whom no news ever surfaced again – or at least this is what is commonly repeated. Newly discovered documents are now revealing us the whole story.